Hologram Safe Laser Checks provide the highest degree of security deterrents available. This state of the art, anti-fraud technology adds multiple layers of security protection to your laser checks. Your existing check format will be used with a top, middle or bottom check position. Free proofs are always available for your review. These Hologram Safe Laser Checks SHIP FAST... within 24 - 48 hours once we have your order information. STEP 1 - Place your Hologram Safe order below. 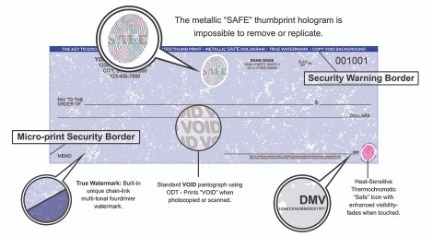 Digital Micro Validation (DMV) is featured on Hologram Safe Laser Checks. With DMV, your signature line will have consecutively numbered micro print embedded in the signature line. When your checks are viewed under magnification, the signature line consecutive number will match the consecutive number of the check to prove its authentication. This exclusive, patent-pending security feature is available at no extra cost with Hologram Safe Laser Checks!